Perhaps the most important word-changing task is getting others to see a vision and take action toward it. You can do this in many ways: videos, books, online. But nothing beats an in-person presentation. Done well, that is. You’ve been in that room…way too many times. The powerpoint presentation begins. By the third slide you know it’s going to be dreadful. Slides full of words read out loud, charts you can’t read, information endlessly spewed out. Or painfully worse, that’s you droning or rambling on at the front of that room. Take heart! You’ve got a friend. Author Nancy Duarte has worked on thousands of presentations, most notably An Inconvenient Truth. In her book, Resonate, she draws on the likes of Joseph Campbell, Martin Luther King, Martha Graham, Abraham Lincoln and Steve Jobs to illustrate what makes a presentation powerful and compelling. The audience is the hero—not the presenter, not the presenter’s organization. The presentation is not about us, but about what the audience can do. Duarte asks us to challenge the audience to a big adventure, a hero’s journey. Create dramatic tension between what is and what could be. This goes back and forth and can be mapped on a “sparkline.” The hero audience is to help make the shift happen. Have a clear, unique Big Idea, what the audience can do and why it’s important. This needs to be said in one sentence. Tell stories. Turn information into stories. Deliver a STAR (Something They Will Always Remember) Moment. Speaking on malaria, Bill Gates released a jar of mosquitoes into the room. Presentations can really change the world. Who would have thought that a movie about a presentation would win an Academy Award, create global awareness, and incite change? Long before An Inconvenient Truth was on anyone’s radar, former Vice President Al Gore had delivered his presentation hundreds of times to influential audiences around the world. You might not need to change the entire world, but you can definitely change your world using a presentation. Many of the people featured in [Resonate] delivered presentations over and over. They didn’t just present once and call it a day. Their lives were spent constantly communicating their visions. To see a systematic adoption of your idea, you may have to deliver multiple presentations. On your way to change the world, there will be key communications milestones that become catalysts for your success. Each milestone is an opportunity to adjust the strategy, collaborate, and realign the team. Brilliant discussions that occur when pulling a presentation together sometimes have as much value as the presentation itself. You can watch Nancy Duarte talk about the basic concepts on the TED presentation, but if you’ve got anything at all to say to help change the world, you’ve got to get the book. A free multi-media version of Resonate’s basic concepts. 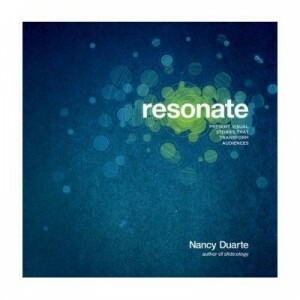 More on Resonate and other communication strategies at the Duarte website.